This is a delicious salad. The flavors are a very nice combination. The borage flowers are slightly spicy like pepper and go well with the sweet strawberries. The salad dressing is particularly nice on this salad, but goes well on others and makes a nice marinade. Combine the tomatoes, garlic, shallots, vinegar, and mustard in a blender and puree until smooth. Add the oil in a steady stream while mixing to emulsify. Add the salt and pepper and taste for seasoning. Pat dry and slice the tofu very thinly. Fry to a golden crispy brown, drain and allow to cool. Clean and hull the strawberries. Depending on size, slice. Peel and slice the avocado(s). Cut and crumble the soy cheese. Carefully clean the borage and elderberry flowers. Make sure there are no insects or dirt. It’s easiest to place them in a small bowl of water. Place the cleaned spinach leaves on individual plates. Arrange the tofu slices, avocado, strawberries, and onion on top of the greens. Sprinkle the soy cheese pieces around and then place the flowers as you want them. We’ve been wanting to include edible flowers i our recipes for a long time. They give an added color and often a nice flavor as well. You can find more information about using edible flowers here. 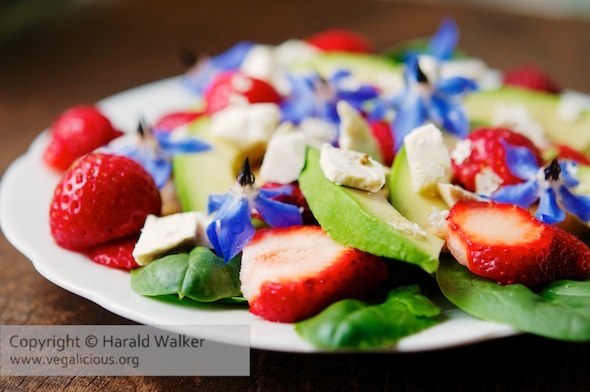 Posted by Chris Walker on June 29, 2012 in Avocado, Edible flowers, Salads, Soy cheese, Strawberries, Tofu.